Devilbiss PulmoMate Compressor/Nebulizer BUY PulmoMate, 4650D Nebulizer Compressor. PulmoMate Compressor Nebulizer is manufactured by Devilbiss and keeps pace with the world by providing an unbeatable combination of quality and value. The sleek case design fits easily into luggage, backpacks and diaper bags for easy transport. The DeVilbiss PulmoMate features an updated compressor/motor for long-term durability and performance. DeVilBiss PulmoMate Compressor Nebulizer Product Number: 4650D. Noise: 53 to 57 dBA. NMAD: 5 microns or less. Maximum Compressor Pressure: 35 PSIG or greater. Compressor Free Air Flow: 13 LPM. DeVilbiss PulmoMate Compressor Nebulizer Warranty: 5 year limited. 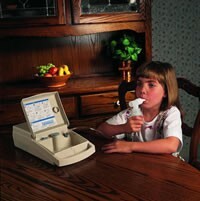 PulmoMate Compressor Nebulizer Brochure offers highlights of this nebulizer's features. 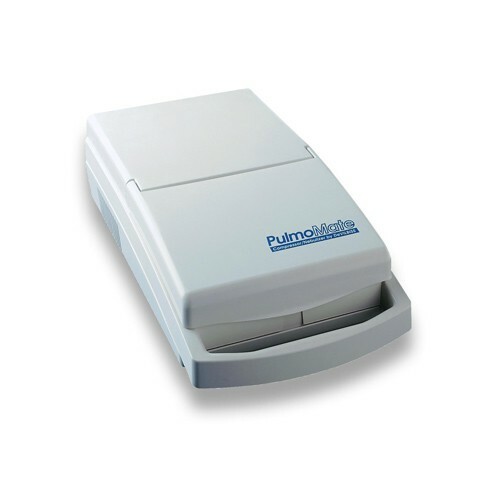 PulmoMate Nebulizer Compressor User Manual provides instruction for use, cleaning, maintenance and specifications. DeVilbiss PulmoMate Compressor Nebulizer Parts displays part numbers with names. DeVilbiss PulmoMate Nebulizer Compressor Warranty offers 5 years of protection against defective workmanship and material. Does this come complete with everything needed-hose, mouthpiece, etc? This is the first one ever buying. I've lost my instructions. How does one clean the apparatus after use?? 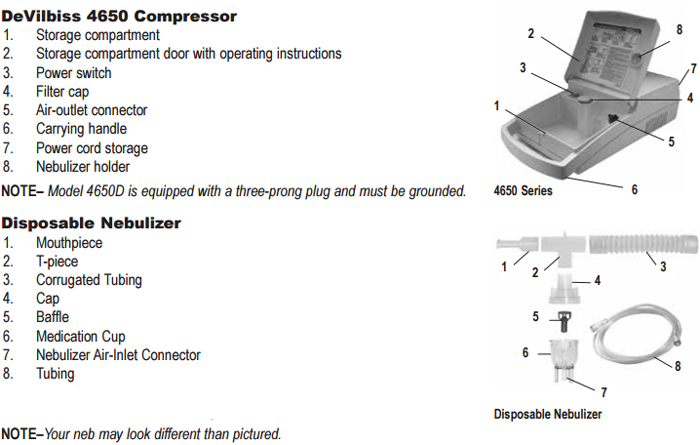 There is a user manual available on this page that will guide you in cleaning the compressor/nebulizer. It uses 2.5 amps according to the manufacturer. I love this machine. Ive had one for over 10 years snd it still runs. I bought two of these and within a year they started sounding like a threshing machine. And then they failed. Then you learn that they will ship you replacement unit (s) but you have to pay shipping to return the defective items which will cost you somewhere between half and what you paid in the first place. Then you wait and wait for the replacement only to find that they shipped UPS ground so it will take a business week (Saturday and Sunday do not count) before you get the replacement. Or if you are really lucky like me, after a week and it isn't there yet you ask for a tracking number only to find out that they shipped to the wrong address in the wrong state which restarts the week shipping clock because even though it was their mistake, you get to gasp for another week (I bought another Different machine). So if you like having your apartment neighbors mad at you for using what sounds like a threshing machine at 4 in the morning after using this machine for about 6 months, this is the machine for you. Hopefully, it will not completely fail before you can get a replacement. Vitality on the other hand has been great trying to get the problem solved. Nice compact unit, works very well with equipment from our dead nebulizer. Love the 5 year warrenty.